The brutally cold weather this last week really put a damper on the birding this weekend at the shore. Barbara and I busted on EVERYTHING that we tried for today in Cape May. No Western Grebe. No King Eider. No Crossbills. We did get 2 Razorbills flying past Cape May Point so I guess that was a bright spot. 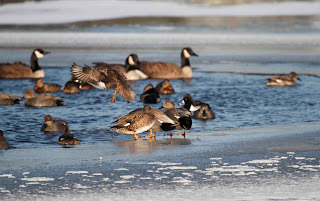 I just learned a valuable lesson - freezing temperatures make birds move away from frozen places so don't go visiting frozen places looking for birds. Here is a photo of Lily lake in Cape May today. It was about the only open fresh water for miles. Look at all of the ducks and geese crammed into that little ice hole. Of course, none of the birds that we needed were there, but there were still some nice looking ducks out there. 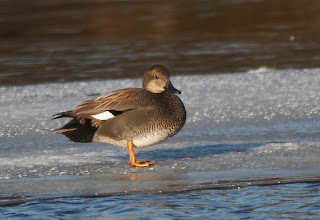 Here is a pretty nice photo of a Gadwall standing on the ice. We left Cape May after busting for the birds that we hoped to see and screamed up the Parkway back to Assunpink to try for those damned weird geese again. Busted again there. The lake is completely frozen over. The only things on the ice were a few swans and a guy trying to kite surf. We even busted on White-winged Crossbills at Assunpink even after our friends told us that they just saw 2 of them. And, even though we ran into Scott Barnes (expert birder from NJ Audubon) and his friend Linda (another expert birder) who were also looking for the birds and couldn't find them either. 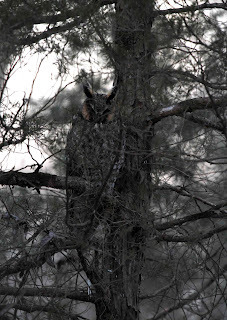 Thankfully, our friends Patty and Steve told us that they saw a Long-eared Owl earlier down in Medford area. We are just glad that we left time to go see it. It was awesome! The owl was in the woods in dense trees. 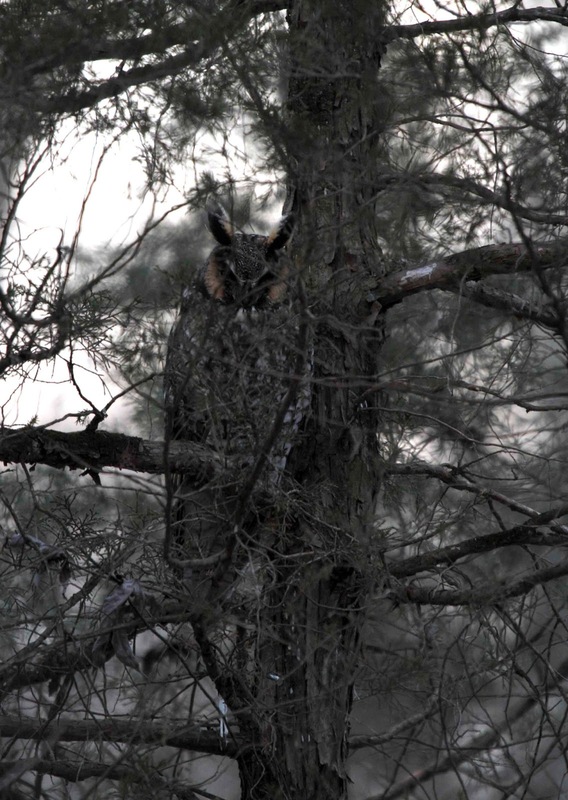 Check out how camouflaged the owl is against the trunk of that pine tree. We can't tell you where the owl was because we were sworn to secrecy. We are protecting the owl's privacy so that it can do what it does best during the day which is be camouflaged and rest. I don't know how much birding I'll get in before heading to Cleveland for a workshop, but I'll let you know if I see anything interesting. 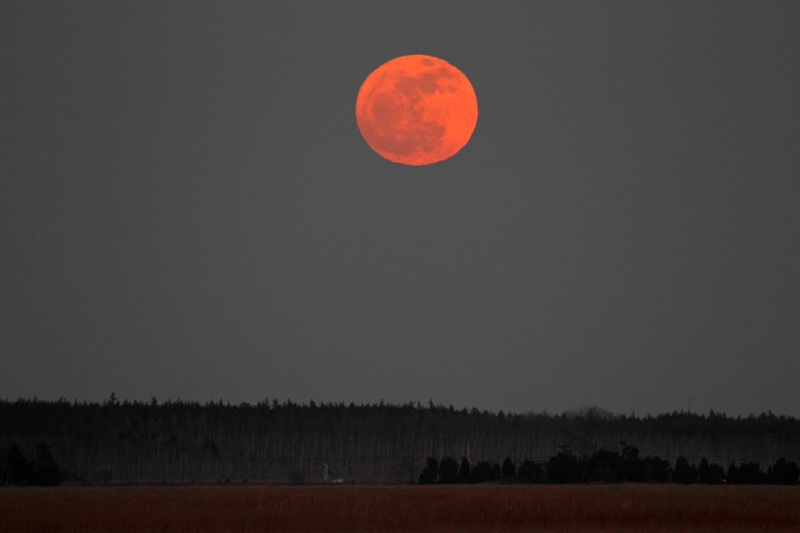 I forgot to post this photo of the moon last night at Jake's Landing. It was just stunning. I don't remember signing a permission slip for you to go to Cleveland, aka The Mistake On The Lake. I'm always cautious about viewing any "moon" shot that you're involved with, but this one was worth taking the risk of clicking on the image to enlarge it. Just gorgeous.